McDonald’s Family Restaurants of Greater Washington, D.C. want to thank you for your continued support by participating in the biggest giveaway to hit McDonald’s restaurants, along the Eastern Seaboard, from Maine to Miami! 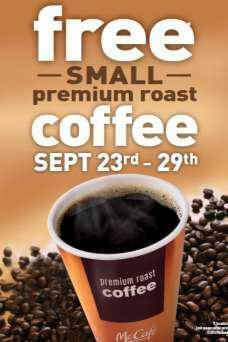 From Sept. 23-29, in honor of National Coffee Day on Sept. 29, local McDonald’s will be hosting a week-long celebration by offering FREE small Premium Roast McCafé Coffee to all customers. No coupon or additional purchase needed! To kick off the celebration, street teams, accompanied by a giant McCafé coffee cup will be giving away coupons near the Silver Spring and Metro Center (12th & G streets entrance) metro stations on Monday (September 24th) and Tuesday (September 25th) from 7:30 – 11:30 a.m. In addition, people will have the opportunity to take a photo with the giant cup, tweet it to the local McDonald’s twitter handle @McDonalds_DMV and have their photo appear on the local Facebook page! McDonald’s is offering a super fast giveaway to my readers! The first 5 (five) followers in the DC-region to comment on this post letting me know how you take your coffee will receive a coupon for a McCafé beverage of your choice for free. Coupons will be mailed by Greater DC McDonald’s and will only be valid in the Great Washington, DC area. If you’re reading this via email, you’ll need to click on the title to be taken to Redberrydeals.com, where you can leave a comment. Please follow McDonalds Washington, DC on Twitter to be the first to know of their promotions! Send them a quick tweet, thanking them for their terrific healthy deals! Fine Print: These FREE McCafe beverages will be given out in the form of coupons – these coupons will be valid in the Greater Washington, DC area. I drink my McDonald’s coffee with cream. Their premium roast is so good! I take my coffee black. Thank you! I wasn’t sure about the Frappe, but have become a huge fan. the McDonalds frappe is better than a frappicuino! Chocolate Chip is my preferred flavor. Would love a cup of McDonalds Mocha. Thanks for the giveaway. What a great giveaway! Thanks for letting us know! ; ) Love McCafe frappe. IT is wonderful! Let me know about the coupon. I remember the big cups of coffee from a prior promotion.